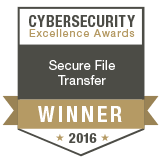 Linoma Software [now HelpSystems], a leader in providing enterprise-class security and managed file transfer solutions, has been awarded the 2016 Cybersecurity Excellence Award. Linoma's GoAnywhere Managed File Transfer software was chosen as the winner in the Secure File Transfer product category. Feature-rich and affordable, GoAnywhere MFT garnered high praise from voter participants. "Our company leverages dozens of software solutions. None has a better value proposition than GoAnywhere. We've automated manual processes, saving time," said Shaun S. "We've secured existing file transfers with minimal effort and no disruption. And we've migrated acquisitions off products that cost ten times more at no additional cost to our existing structure!" The Cybersecurity Excellence Awards honor individuals and companies that demonstrate excellence, innovation and leadership in the information security industry. Nominees were carefully considered by the Information Security Community on LinkedIn which is comprised of over 300,000 cybersecurity professionals. Weighing in with their votes and comments, the group determined the final winning products for each category. "Congratulations to Linoma for being recognized as the winner in the Secure File Transfer product category of the 2016 Cybersecurity Excellence Awards," said Holger Schulze, founder of the 300,000-member Information Security Community on LinkedIn. "With over 430 entries, the awards are highly competitive and our winners reflect the very best in product innovation and excellence in the cybersecurity space."